The autonomous driving space is in a very exciting place right now. Not just because of the eventual convenience of having our cars drive us to work (or pick us up from the bar), or from the life-saving improvement in safety we might see, but the industry is incredibly exciting because of all of the innovations that are constantly bubbling up. Daydreaming about watching Netflix (NFLX - Get Report) while we sit in our cars is cool. But seeing all the new companies, ideas and concepts evolve and the speed at which this evolution is happening is quite intriguing. One such company is Renovo. Speaking with CEO Chris Heiser, he described his company as the platform that autonomous application companies build on -- "think of us like AWS," from Amazon (AMZN - Get Report) , he said, referring to Amazon Web Services, which provides on-demand cloud computing platforms to individuals, companies and governments on a paid subscription basis. "Building web services is challenging -- just writing the software -- but then there's the whole question of how to scale it, how do you make it reliable, all these sorts of things. So we solved that problem," Heiser explained. What many casual autonomous vehicles (AV) observers don't realize is how many different applications can be involved in an self-driving car. Something that seems as simple as a high definition (HD) map is actually a complex product involving huge amounts of data. There are artificial intelligence (AI)-based interactions happening both inside and outside the car and an entire ecosystem of opportunity. That can range from media content to asking the passenger whether they'd like to place their favorite order with Starbucks (SBUX - Get Report) or Domino's (DPZ - Get Report) as a location comes within a certain distance. There are dozens of sensors, cameras, radar, lidar -- all sorts of devices to analyze everything from driving distance between two cars to whether the driver is nodding off and falling asleep. The bottom line: there are dozens if not hundreds of considerations for the future of autonomous driving. And while Renovo is not solving each one of its own, it's making a platform in which solving those problems is more efficient and achievable. "This is exactly the way you build web services, the way you build big data centers, it's basically the way all modern software works today -- except for automotive," he said. "So we're changing that; we're bringing a true platform approach to building these next generation automotive systems." Branching out more broadly, Heiser spoke about the autonomous driving landscape in general. As far as mobility services, Alphabet's (GOOGL - Get Report) (GOOG - Get Report) Waymo is the current leader, he says. The company is currently testing its service in Phoenix and hopes to officially launch by year's end. Beyond that though, Waymo is gearing up for a larger rollout. The company's orders for up to approximately 82,000 Fiat Chrysler (FCAU - Get Report) and Jaguar vehicles implies it has much bigger plans ahead. Heiser estimates it will take roughly 5,000 to 10,000 AVs to roll out an autonomous taxi service per city. By that estimate, Waymo looks like it's attempting a 10 to 20 city rollout over the next few years. "That sounds about right to me," Heiser said, adding that it would be a "reasonable rollout." Waymo is the leader now, but that doesn't mean everyone else should give up and go home. Just because the company has a rollout in Phoenix doesn't mean it can easily migrate to Minneapolis or Detroit. Even Waymo CEO John Krafcik alluded to "migration" issues in previous discussions, pointing to geography, weather and other considerations as potential hurdles. 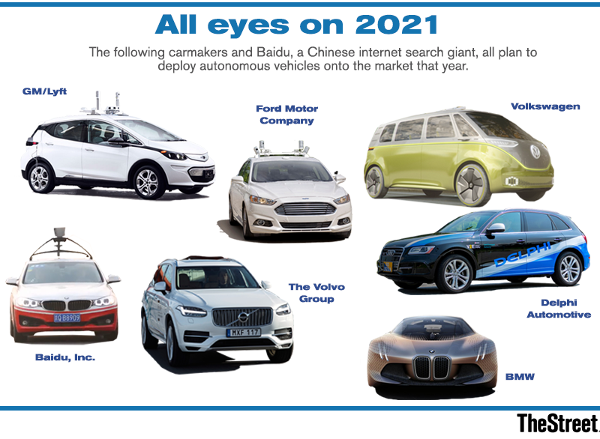 There's still room for plenty of other players in the robo-taxi space, be it General Motors (GM - Get Report) with Cruise or the recent partnership between Bosch and Daimler (DDAIF , which will use Nvidia's (NVDA - Get Report) DRIVE Pegasus to power its autonomous fleet ambitions. The analyst community predicts that mobility services will reach large valuations. Morgan Stanley recently put a $175 billion valuation on Waymo. RBC's numbers went even higher under some circumstances, while its long-term estimates for Cruise went above $40 billion. Keep in mind GM bought the company for a reported $1 billion (including incentives) in 2016. Ultimately though, these companies are providing logistics services. Moving people is one scenario, but so is delivering goods and shipping products or supplies. Transportation is a $2.3 trillion market and that leaves plenty of room to support high-valuation companies that are creating highly disruptive technologies, Heiser noted.